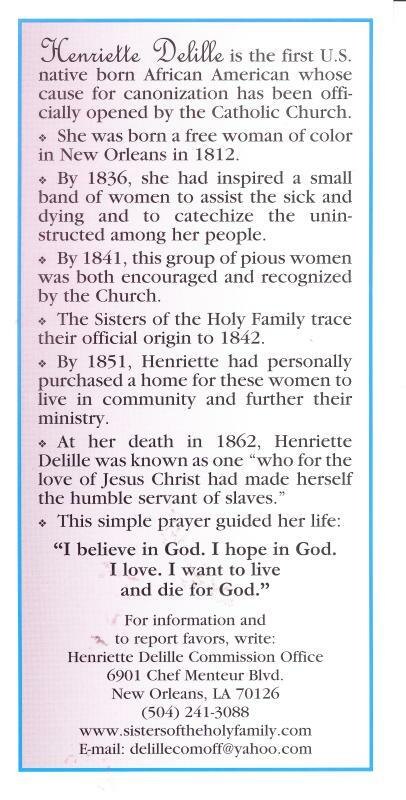 Henriette was called Servant of God, the first step in the canonization process. From 1988 until 2005 historians and theologians researched and studies Henriette's life. 2005 - The life, virtues, and reputation of sanctity of Henriette Delille were tried at the Archdiocesan New Orleans Tribunal and an alleged miracle attributed to her intercession was tried in the Galveston-Houston Tribunal. 2006 - All documents, nearly 6,000 pages, were signed, boxed, sealed, sent to Rome and registered at the Congregation for the Causes of Saints. These documents were declared valid on November 10. 2007 - The Positio, a compilation and defense of all the documents, written by our Postulator, Dr. Andrea Ambrosi, on Henriette’s Life, Virtues and Reputation of Sanctity was completed. 2008 - Seven historians approved the Positio. 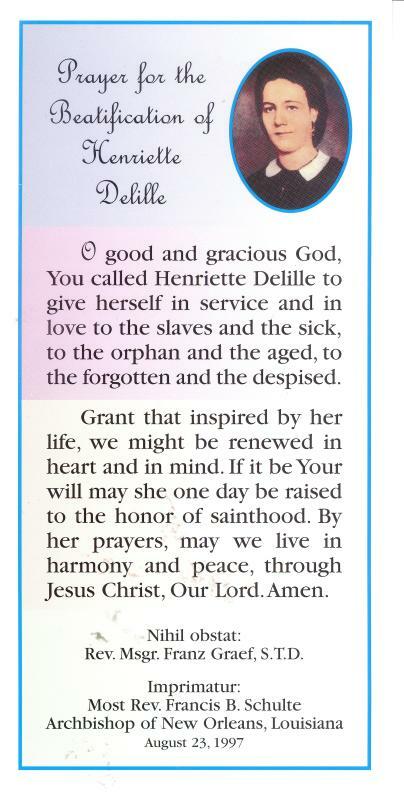 2010 - 15 Archbishops and Cardinals from the Congregation for the Causes of Saints affirmed that Henriette Delille practiced heroic virtue. 2010 - The Pope, Benedict XVI, declared Henriette venerable, the second step in the canonization process. The research into Henriette's life is now finished, and finished with a positive decision. 2010 The Positio on the alleged miracle was completed. It must be approved by: two doctors; then 7 doctors; and 7 theologians. More information is needed. The combined work of the doctors and theologians will be given to the members of the Congregation for the Causes of Saints who will present the conclusion to the Holy Father. 2016 Another alleged miracle is being tried in the Diocese of Little Rock, Arkansas. We await the results. If positive, Henriette will be declared blessed, the third step in the canonization process. The Beatification Ceremony will take place in New Orleans, LA. Another miracle will be needed for sainthood, the fourth and final step of canonization. PLEASE JOIN US IN PRAYER FOR HER BEATIFICATION.